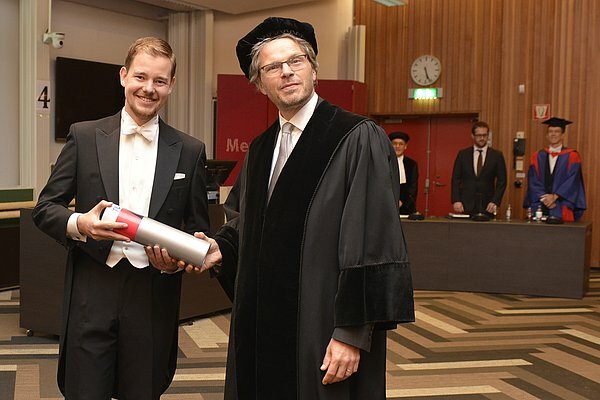 Jorn van der Pol, who was awarded his PhD with distinction at the TU/e last year, has been awarded the Stieltjes Prize for the best mathematics PhD thesis of 2017 in the Netherlands. Van der Pol, now postdoc researcher at the University of Waterloo, defended his thesis entitled ”Large matroids: enumeration and typical properties” under the supervision of Remco van der Hofstad and co-promotor Rudi Pendavingh. In his thesis, Van der Pol established a connection between enumeration and complexity that led to a breakthrough in the question of how many matroids there are at a fixed set of points, and how to derive typical properties of large matroids. Various researchers have been working on these issues since the 1970s, including the world-renowned computer scientist and mathematician Donald Knuth. Van der Pol's research provides new insights that have blasted new life into the field of mathematics when it comes to matroids. The jury praised the excellent quality of the research as well as the depth and originality of the work. The jury report states that the well-written concluding chapter "Discussion and future work" testifies to insight, overview and vision. They also consulted external researchers in this field who greatly appreciate Van der Pol's work. That is why, in the eyes of the jury, Jorn van der Pol is the worthy winner of the Stieltjes prize 2017.